Soph’s out on Thursday, so I’m going to spend the evening winning at being middle class again, popping down to the local pub on Thursday night on my bike to pick up some locally produced produce from our local food assembly. 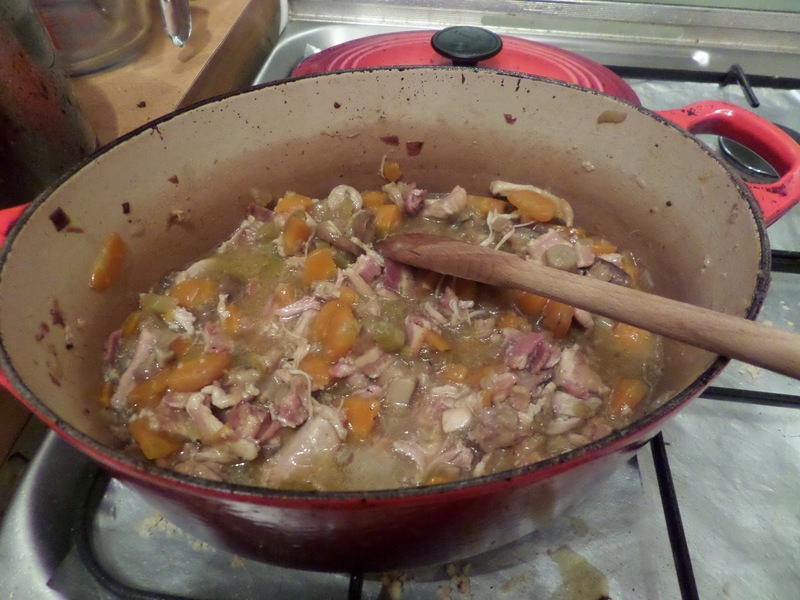 This week I’m picking up some rabbit, rainbow carrots, celeriac, onions and streaky bacon. 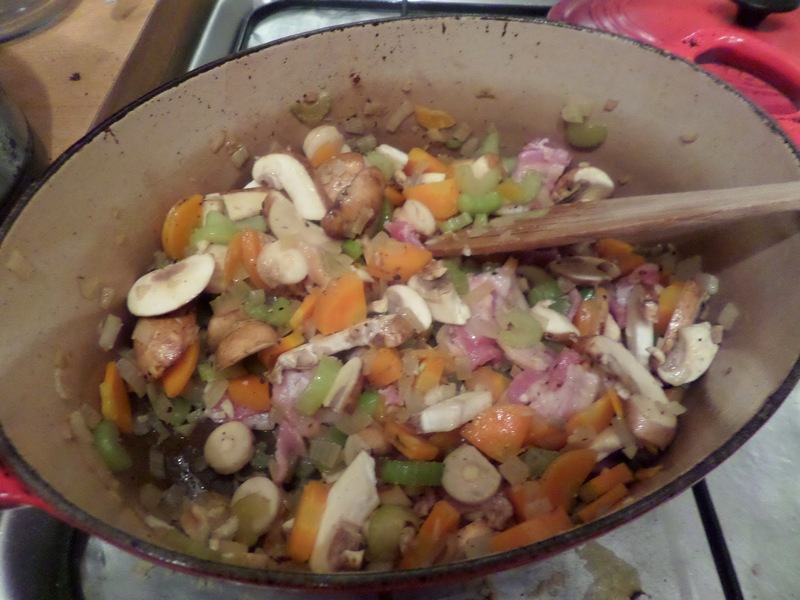 I’ll use this mix, along with some pantry staples, to create a rabbit pie for Friday night. Well I was planning on picking up rabbit… but their courier had an accident on the way to deliver it (I hope they’re OK!) and so I’m only getting the veg. So it’s some defrosted chicken thighs instead. I’m basically going to follow the procedure from my previous beef and venison pies. 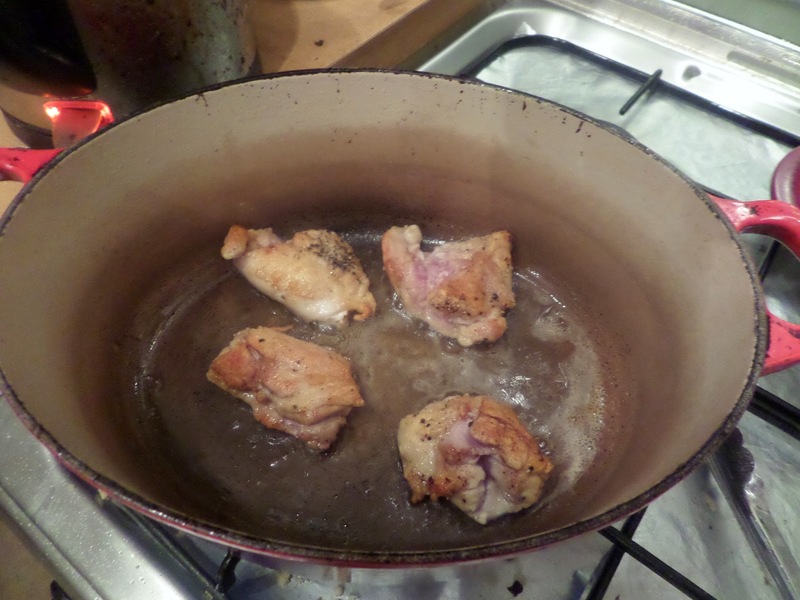 I’ll season the rabbit chicken, dust with flour, then brown, and deglaze the pot with white wine sherry. 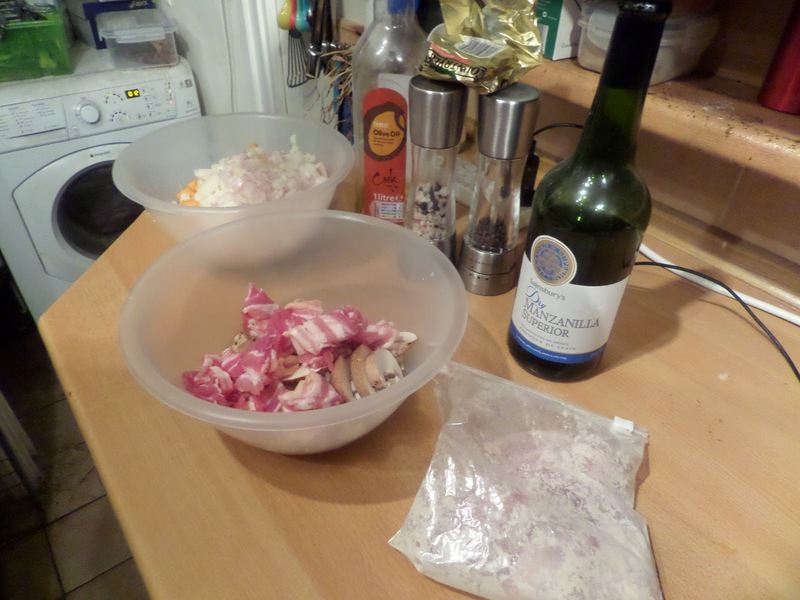 Then add in bacon and garlic. Oh and some mushrooms I found in the fridge. It’s become chicken and mushroom pie! 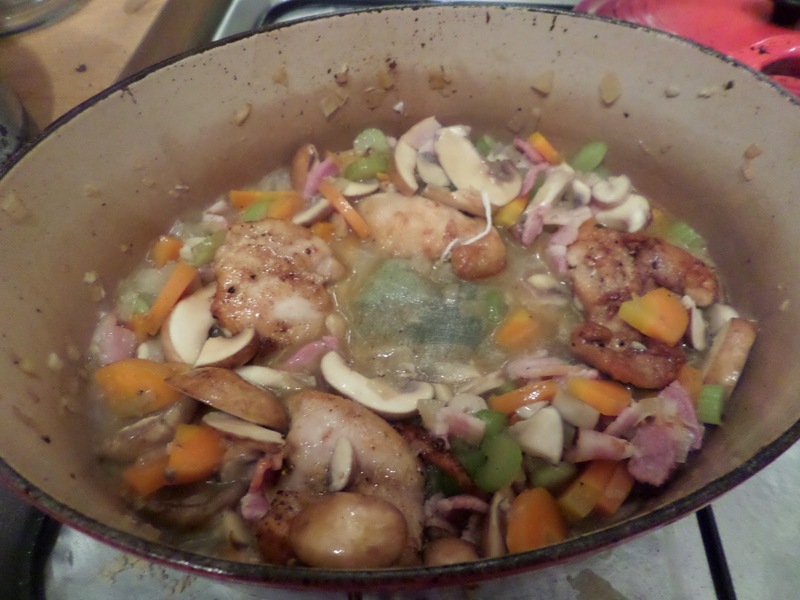 Then add the rabbit chicken and wine back in, add bouquet garni (thyme, sage, bay leaf) top up to braising level with chicken stock, bring to simmer. 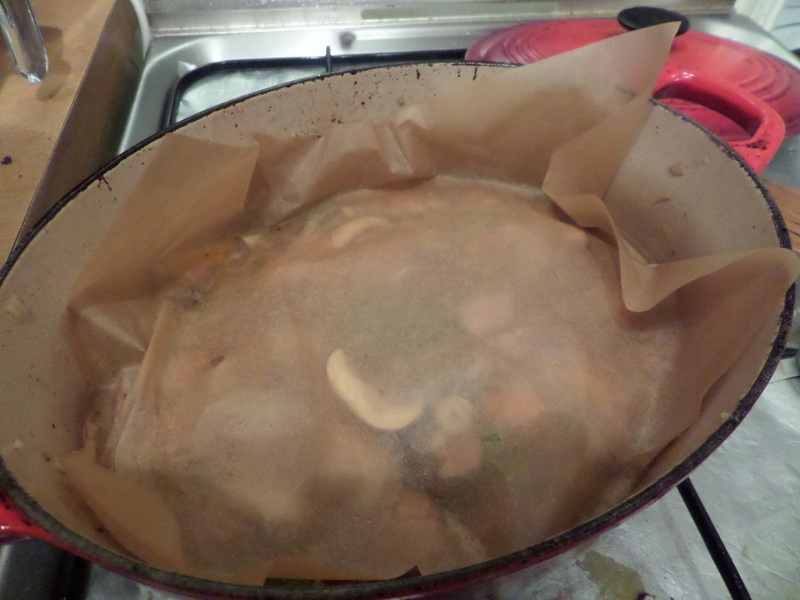 Add a cartouche, cover, and put in the oven at 160C fan for a couple of hours. This didn’t go so well. 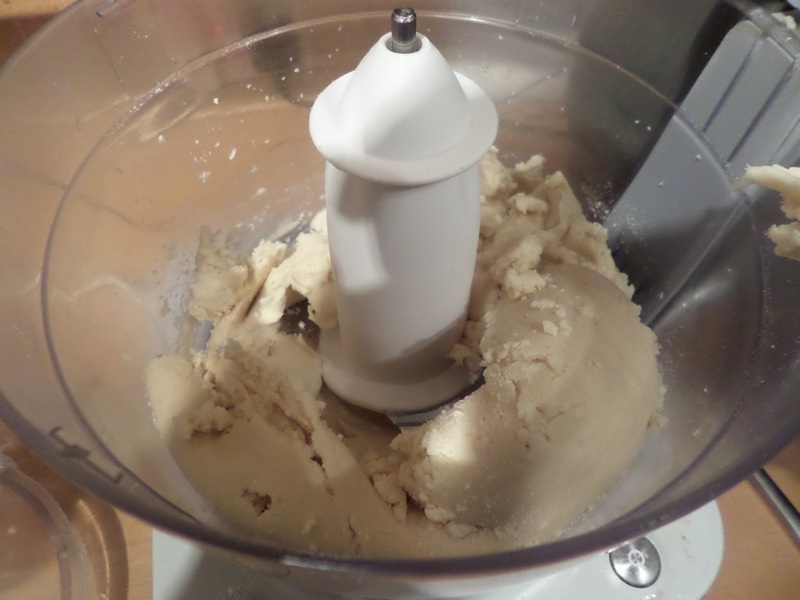 I used about 50g of butter, and forgot that it’s about 20% water… so after adding the extra water it was very sloppy. So I added more flour… then more… and more – all the time processing it more, so I’m worried I’ve really overworked it. Finally shred the cooked chicken and return to the pot. That’s it for Thursday night. 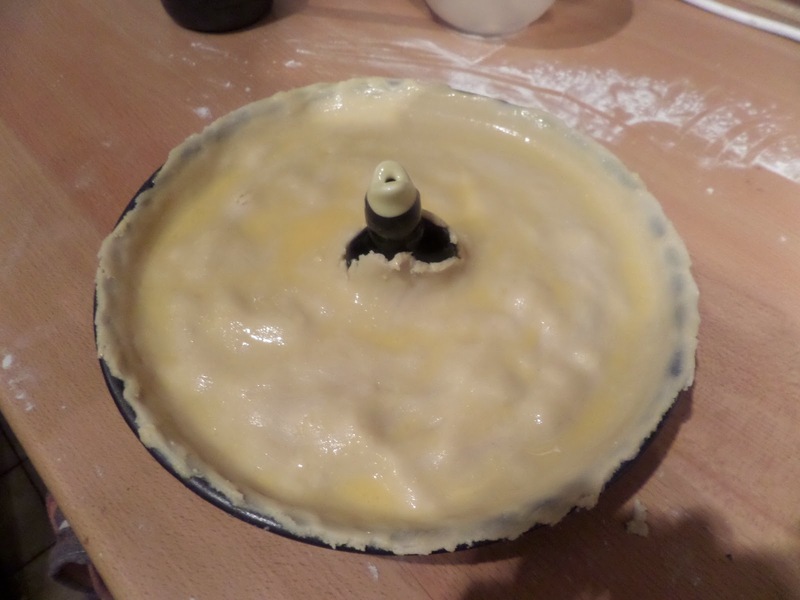 Roll out the pastry and make the pie. Get interrupted by the weekly food order arriving just as you put the pastry over the pie, and return to find the pastry has fallen off the sides so you can’t make a good fluting at the edge… Anyway: glaze with egg. Bake at 180C fan for 50 minutes. 180C fan for 50 minutes it’s also the time I’ll need to make honey glazed roast carrots according to this BBC Good Food recipe. 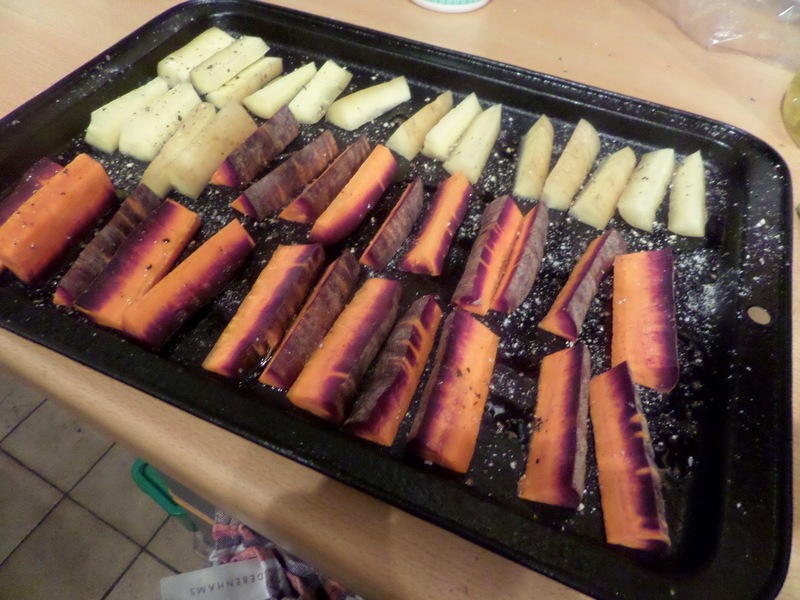 Well it says 170C fan, but carrots always need more cooking than advertised! Basically season & oil then roast for 30 minutes, then apply white wine vinegar & honey for the last 20 minutes. Finally there’s the celeriac, so I’m going to go with Jamie’s smashed celeriac. 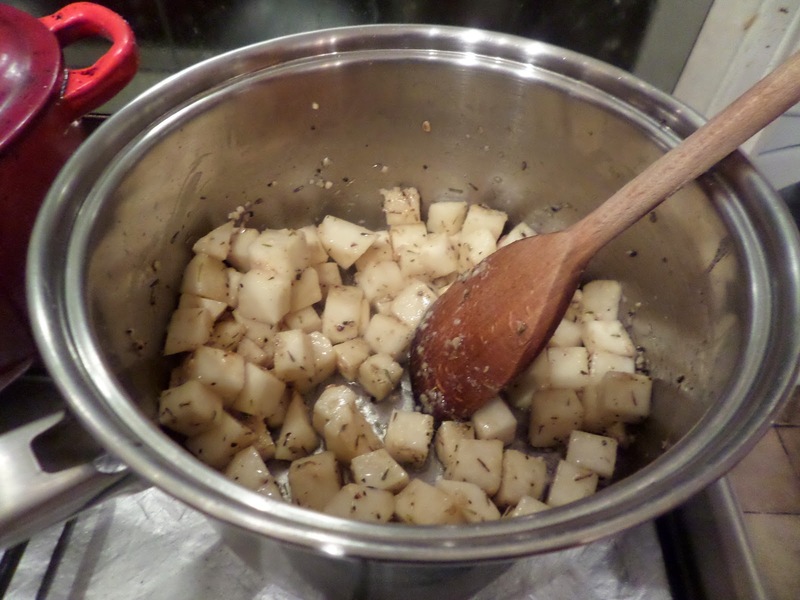 Cube the celeriac, season, fry up in olive oil (it’s Jamie…), thyme & garlic, then add a few Tbsp of water, cover and simmer for 25 minutes. Then smash before serving. Worries about pastry were unfounded! I think it helped that I’d rolled it pretty thin, but it was lovely and melty. And the filling was delicious. 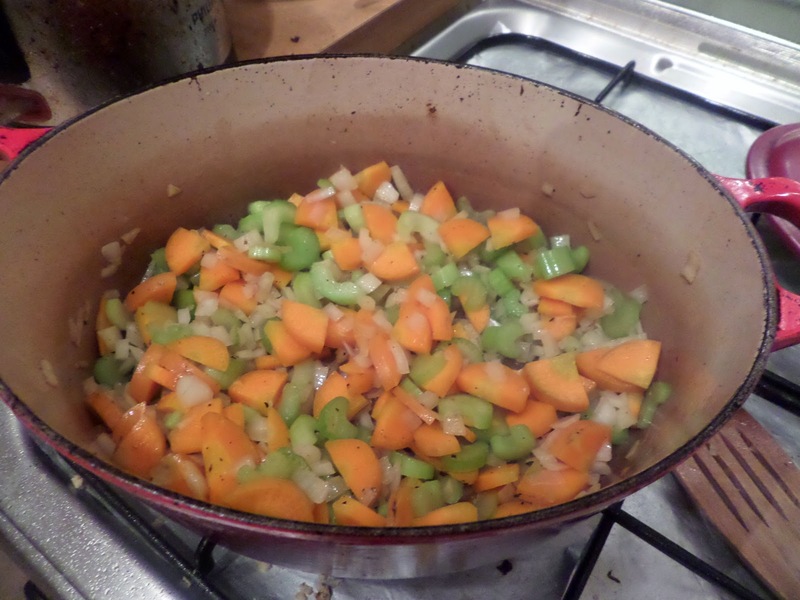 The carrots were fully cooked, which was nice, and they were as expected delicious. The celeriac, on its own, was nice, but when paired with either pie or carrots was really good. We’ll defiantly be doing celeriac (s)mash again. The only real problem with the dish is it looks very brown. 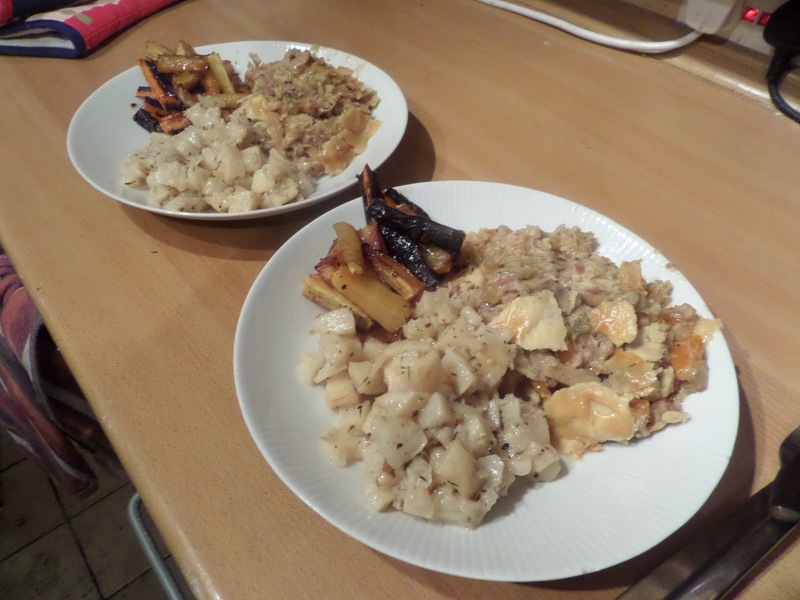 With half the carrots being white, plus white celeriac and creamy pie… it looks horribly brown and unhealthy, but honestly it’s actually not that bad! Looks and sounds tasty. Think I’d have preferred rabbit for a change. Hope the rabbit courier is OK.